And I'm still in kind of a no-drawing-funk. So, an update so people new to the situation won't have to read through forty billion comments to get the story. Comic is probably not dead; me and a new artist are currently in talks. Less talks and more doing stuff at this point. She's caught up in some holiday herpaderpin' I think, as was I for a while, so there's been a bit of a delay in it all. Hopefully it all gets sorted out and we can get into some sort of schedule-esque thing and maybe my E-mail account won't consume sent pages for sustenance like it's been known to. I've done that, except for owning a sleeveless undershirt. Glad to hear about plans for more! Yay!!! Thank you Morg and Thedandmom ;) That's great news, you guys take your time, we've waited this long we can wait longer. And cool tree! Oh, and thanks for the chat thing :) It's Christmas!!! Oh, don't thank me for the chat thing. The Chatango dealio is actually BlueMario's handiwork, I'm just passing along the info. 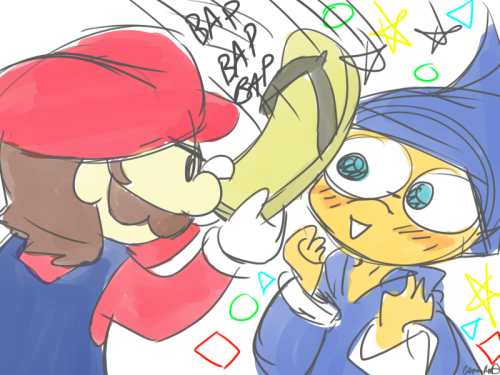 Why is Kamek so kawai-happy to be beaten with a flip-flop? Why did Kamek transform Mario's entire inventory into flip-flops in the first place? 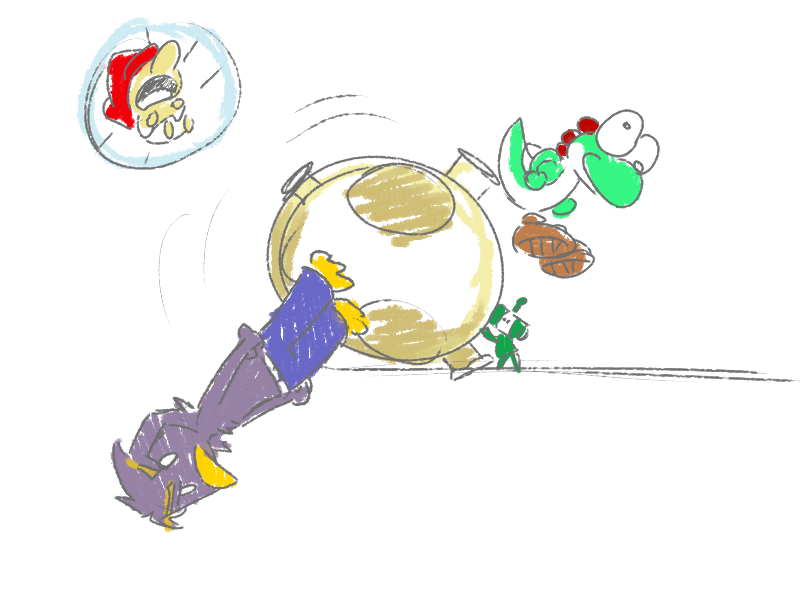 I didn't have anything rare on me save for a giant hammer, so I just sat back and enjoy Mario's flipflopping action.. I really wanted to use the giant flipflop, but I didn't know at the time if I needed that hammer for anything or if I could get it again easily. And I think my problem with the next immortal fool page is that I don't know how to draw what I'm supposed to draw for it. Golly. Hmm, it's possible I would understand better if I had ever owned a single Mario game. It's not quite true anyway, I did once own Super Mario 64, but that was the only console I ever traded in. The game itself has been doing a mighty fine job with Mario and the toads endorsing violent racism against brown, arm-disabled chestnut people, but in all seriousness, this is internet and I know what you mean. I've just cleared out the first three worlds. Maybe missed a THING or two along the way. The good thing about playing this game over a month late is that I get to rely on guides made from the blood, sweat and misery of other people that played the game before me. 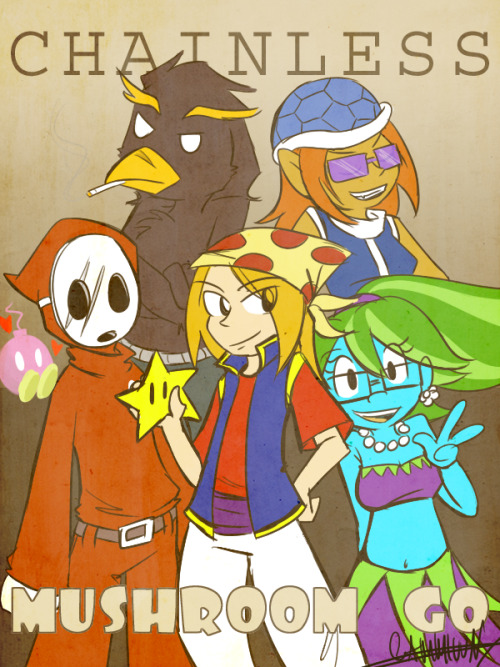 Like Mariachi Guys as in a Shy Guy Mariachi Band? Or just a Mariachi Band? If it's just a band, you could easily do it with Piantas, because they have been known to play maracas and various instruments already in SMS. I faced these guys a couple of nights ago, and then when I headed for a job interview the next morning, a trio of Hispanic panhandlers entered the crowded train with mariachi instruments and started playing a song. I thought that was Hysterical, especially since I couldn't unsee them as shyguys. Yay, a post by Morg! I cannot wait for new stuff... and this reminds me I should play sticker star more. I seem to have been logged out of my thing... pity. Anyway, as I have said above. As one of your 3 subscribers, I'm slightly interested in knowing if your planning on continuing Tempting Transfinity, or is that a ghost project? I ended up getting distracted with work, holidays, sickness, and getting back on the Mushroom Go train... and a wide assortment of side projects that haven't really gone anywhere yet (learning video and audio editing, Game Maker 8, can't stop playing Wii U etc). I'd like to do more Tempting Transfinity, I just have to ... well, find time to do Tempting Transfinity. That, and get over my initial frustrations. I tend to write by the seat of my pants, and I realized after page two that I could have done some really neat things and I did some really boring things instead and got mad. I hate doing something stupid right at the outset like that. I've had some "oh my gosh I should have done that" moments in Mushroom Go, but they were really far in and made up a small percentage of the whole narrative so I didn't feel like I'd wasted a whole plot. Sounds like me when I write software, but I have the advantage that I can completely rewrite software (which I do a lot for the reasons you mentioned) without anyone caring especially because the software I've built myself is all still in beta. I can understand completely, I used to write allot when I was younger and I ran into essentially the same problem. It almost always lead me to never publish anything I wrote :). I really appreciate your honesty every time you answer questions, you don't make excuses. Which is awesomely refreshing. whoops, forgot to log in. and it was actually accredited to my by Morg. That tree looks like it would explode at any moment. Knowing Morg's fondness for obscure hints and epic foreshadowing, could this be a clue of some sort? I think the next plot is going to be about Shrapnel's family tree! Happy New Year, Mugo community! Haha, glad I'm not the only one! I'm one of the excited bunch too. I just......... neglected to speak 'till now. Now my daily-hourly check of Mushroom Go isn't sad. It's so much more fun looking at a Christmas Tree than "It's over" Thank you Morg and thank you Thedandmom! And Have a Happy New Year! Sorry this is taking so long...i almost had it done...and then i lost all my work. The coloring was so pretty too. Should have it done soon. "If sexual arousal lasts longer than three hours, contact your physician." Yup. Time to call a doctor. Oh and it seems you've inherited Morg's bad luck with computers randomly crashing, dying, and losing his work. Even if you computer gives up and dies, don't YOU ever give up! That's my biggest fear when drawing comics. Mushroom Go is... not dead? Would you guys like it if one day I ran a Livestream session where you watch me whip up silly doodles of MuGo characters? Tuesday night at 7pm-ish EST (may be a bit later if I'm caught up with something). It'll be on Channel Tartarus. 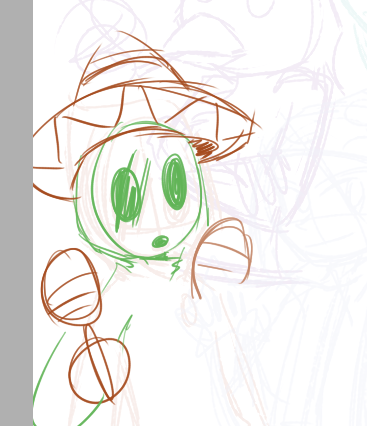 I'll be streaming the next highly experimental page tonight. Let me know when you're off sometime so I can plan one that you can attend! The gang at the stream say Hi to you, Morg! Totally would do this again. Thanks for keeping me company, guys! Uncle Arnie will fry them alive with his hex vision! I would like to say (and just take it as a compliment, I realize this will probably have no further impact on any development) that I would have no objections to having the rest of the comic drawn in this style. Maaan, I didn't find out about this until an hour ago. I'm sad. oh well, I can always watch the recordings! I'm planning another session this weekend! I would love it if you could make it! Oh mah lord you guys are the best. Sunday night same time it is, then! There's now a recording of the first three hours of the stream. I lost the session with the other two.